Longtime Rep. John Conyers, D-Mich., is facing tough questions from a Democratic opponent who is arguing that some of the signatures Conyers gathered to appear on the ballot for his re-election campaign are not valid. Conyers’ opponent, Rev. Horace Sheffield, claims a number of people tasked with collecting signatures to secure Conyers place on the ballot were not registered voters, a violation of Michigan law. State law says that “circulators” – the individuals collecting signatures – must be registered voters for the signatures to count. "Several of the circulators were not registered voters when they were collecting signatures," Sheffield spokesman Adolph Mongo told NBC News. "It's unbelievable that a person that has been in Congress for this long is having these problems, but it is what it is, and these people were not registered to vote, so these signatures were not valid." "Conyers has to step away, his campaign is in disarray, and this is not going away," Mongo continued, "From where we look at it and his campaign, Conyers is not eligible to be on the ballot." But Conyers defended his circulators, saying this issue will be resolved, and telling NBC News "my petitions are good." "I was told that the clerk had a back-log of people who had registered, and they hadn't been put in the files yet," Conyers said. "That's what my impression is right now." In Michigan, candidates must obtain at least 1,000 signatures gathered by the circulators. Conyers, who has served 25 terms in Congress, is in a particularly tough spot, as he will become the longest serving member of the House of Representatives next term after Rep. John Dingell, D-Mich., retires at the end of the year. If he were left off the ballot in Michigan, he could technically run as a write-in candidate, something that he says he would not do. "I would not even consider being a write-in, I filed two thousand signatures. 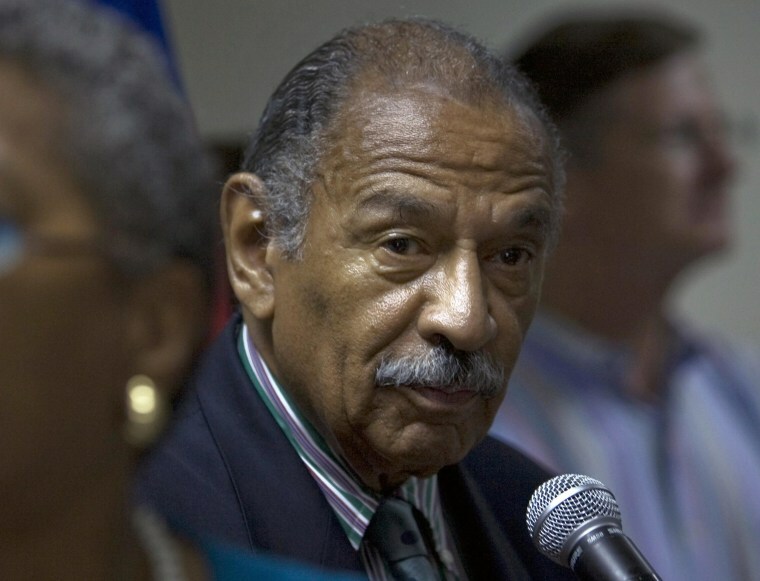 I mean, I only needed a thousand," Conyers said. If Conyers does make it on the ballot, he would likely easily win reelection, as he won in 2012 with 82.8 percent of the vote.